We here at the Bucket are atheists and while we give Papa Francisco some props for his views on capitalism and his ‘evolution’ on scientific matters, we think he’s still way off on many issues such as women’s rights, birth control and of course, the whole God thing. But what annoys us the most isn’t the pope; it’s about the majority of humans, not only in this country but worldwide. Scientists have been touting evolution, the big bang, climate change and other scientific discoveries and facts for years and nobody listens. Scientists base their findings on solid data and evidence gathered over many years using the scientific method and religious people reply to this with an ‘oh I’m skeptical’ reply, ignoring the implausibility of their own ‘beliefs’. And yet Papa Francisco, who knows far less about science than your average scientist, comes out and says climate change and evolution are real, and suddenly, all the sheeple say, ‘Oh maybe there is something to this.’ So humanity won’t listen to people who actually know something about how the universe works but they’ll listen to somebody like the pope, who in our opinion, knows little about how the universe functions. Hmmm, could that be why the world is in such a colossal mess? 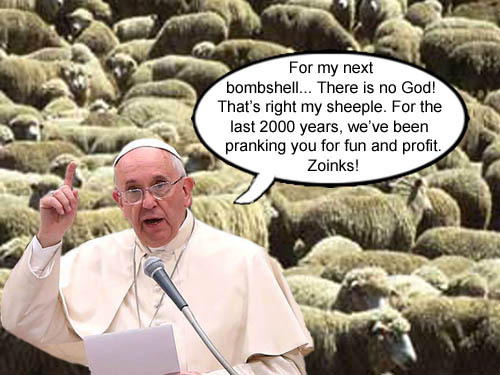 But wouldn’t it be funny if Papa Francisco’s next bombshell for the sheeple was that the whole God thing was… a prank. Move over Ashton Kutcher; we’ve got a new Punk Master! Pope Francis reveals his latest bombshell to his pliant, unquestioning flock. With the recent fallout of the Religious Freedom Bill in Indiana and the launching of Ted Cruz’s presidential campaign from Liberty University, which was founded by evangelical preacher Jerry Falwell, we decided to dig out one of our old photo-toons on Mr. Falwell right after his death in May of 2007. 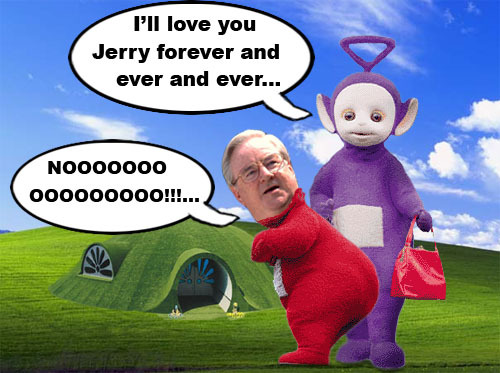 If you remember, Mr. Falwell didn’t particularly like the Teletubbies, especially Tinky Winky. Well, Mr. Falwell finally discovers his eternal reward isn’t quite what he thought it would be. The Reverend Jerry Falwell has just found out the afterlife isn't what he thought it was going to be. Falwell was well known for his controversial, hateful statements over the years. 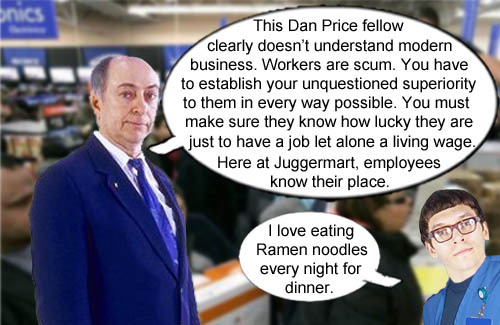 Here’s a short compendium of his most offensive quotes. Yeah, we don’t miss him either. We’ve had a changing of the guard here in Arizona during the last election. Jan ‘Skeletor’ Brewer has handed over the reigns of her wingnut kingdom to former ice cream magnate Doug Ducey (pronounced douchey). Ducey, not to be outdone on the insanity meter by Indiana’s Mike Pence, this past week signed a bill that prohibits women from using the federal health exchange health care program to pay to an abortion. Also they stated erroneously that doctors have the right to tell women that the process is reversible, a claim critics call junk science. But it shouldn’t come as a surprise that Republicans are making up science to match their narrow ideology. I mean most Republicans believe angels exist, think the Earth is only six thousand years old and Jesus co-existed with the dinosaurs. Coming soon from the Republican Science Labs: the Sun really does revolve around the Earth. 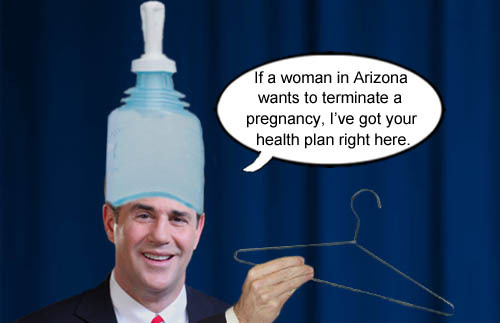 Arizona Governor Doug Ducey (pronounced douchey) announces his ‘old fashioned’ health plan for women who may want to terminate a pregnancy. The nation’s outrage over Indiana’s recent law guaranteeing ‘religious freedom’ and condoning discrimination and intolerance is growing. Boycotts have been announced. Even corporations have announced that they’ll be changing their business relations with the state; which is very serious because this nation is a corporate oligarchy and business is the golden calf here. So you think with all the economic pressure coming to bear on Indiana, do you think conservative christian stalwart, Governor Mike Pence, is going to relent? Hah! No way! He stands firmly behind his decidedly non-christian behavior. Not only that, other leading candidates for the Republican nomination like Jeb Bush and Ted Cruz have announced support for Pence. Because you see, admitting that you’re wrong on anything is not something that conservative christian Republicans do. But as the christians have always stated throughout history(see Spanish Inquisition, Meso-America conquest, Native American conquest, Pacific Islander conquest, Galileo’s scientific discoveries, etc…), it’s not discrimination or intolerance when we do it; it’s God’s will. It reminds us of that old song we learned in church “They’ll Know We Are Christians By Our Love”, which has been conveniently updated in our photo-toon to reflect the state of modern christianity. 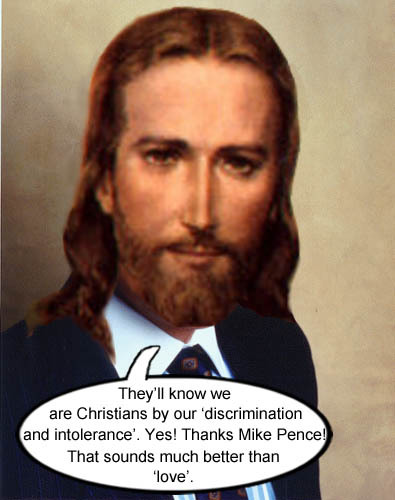 Capitalist Jesus, who is also very Republican, approves of Indiana Governor Mike Pence’s new slogan “They’ll know we are Christians by our discrimination and intolerance”.